St.Lucian born, Jermaine Hall Editor is the Editor in Chief of King magazine. 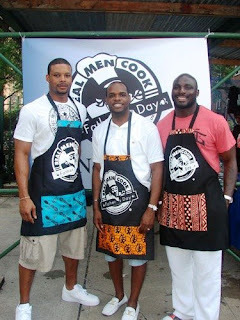 On Father’s Day, NFL baller Kerry Rhodes, Editor of KING magazine Jermaine Hall (middle), and NFLer Reuben Droughns put on their aprons for the Real Men Cook event in the NYC. Real Men Cook for Charity is the largest, longest running annual, urban Father’s Day event in the nation; dispelling the myth that urban communities lack positive male role models. The event has brought together families in over 12 cities to celebrate Father’s Day and the contributions of “Real Men” in their communities. 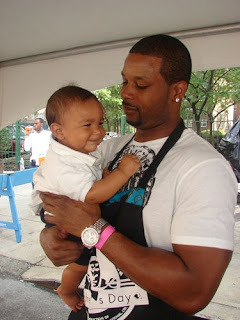 NFL baller Kerry Rhodes was tapping into his future daddy skills kicking it with Jermaine’s baby.